The population of South Africa (here after SA) is currently 56 million. According to world population statistics, SA’s population is expected to reach 64 million by 2030. In the past, SA has been one of the most economically prosperous nations in Africa due to its coastal location and the presence of gold, diamonds and abundant natural resources such as platinum, which account for almost half of its exports. The country is also dependent foreign direct investment (FDI) and on economic contributions from automotive assembly, textiles, iron, steel, chemicals and commercial ship repair. Agriculture and agricultural exports are significant to the country’s economy. In the past SA was solely reliant on commodity exports such as gems and precious metals. In the last three decades the country as expanded its export activities in motor vehicles, parts and accessories, chemicals and steel. The geographical destination of SA’s export markets has also changed considerably over the years, with new markets emerging and some of the traditional markets seeing their dominance reduced (especially with respect to the UK, Japan and Switzerland). African countries, such as Zambia, Mozambique and the Democratic Republic of the Congo have become increasingly important export markets, for SA’s manufactured goods. 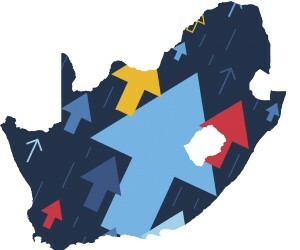 In the years 1999 – 2008, SA’s economy recorded its fastest growth rates with real GDP averaging 5.2% per annum. From a global perspective, this period was characterised by a strong bull-market and booming commodities markets which favoured the countries mining and manufacturing interests. The SA economy also benefited from huge influx of FDI. The significance of FDI for producing growth was stressed in SA’s Growth, Employment and Redistribution Strategy (GEAR, 1996) and has been restated in official statements since. Government policy makers share the view that FDI investors require the following: rigorous macroeconomic policy; deregulation of markets and investment; and supply policies which reduce unit costs and raise productivity and gross earnings. To compete on a global stage SA requires both investment and technology know-how. SA’s underlying need for foreign investment to stimulate growth to some extent as been focused on non-mining activities. Investment into domestic and non regional markets has drawn more than fifty percent of the FDI inflows, in SA. The main objective for foreign investors when entering new markets is of course to generate profit. FDI within SA has as its main objective to supply the domestic market. SA’s domestic markets include a diverse mix of agriculture, manufacturing, telecommunications, energy and banking. Manufacturing is dominated by industries such as agro-processing, automotive, chemicals, information and communication technology, electronics, metals, textiles, clothing and footwear. Whilst not undermining SA’s success in attracting inward investment the country does face a number of barriers to trade which include institutional and infrastructural problems. The five year period 2012 – 2017 was characterised by high levels of unemployment, and almost stagnant GDP. While government efforts to liberalize the public sector and encourage competition have improved, regulatory uncertainty and fragmented competition have hampered both domestic and export growth. Despite SA’s enormous wealth and diversity of rich mineral endowment, the country has not fared as well in part due to changing regulatory regimes, insufficient supporting infrastructure for mining development, and an eroding skills base. Also SA’s political uncertainty and low business confidence are restrictions on future inward investment. SA’s low growth rate and high unemployment continues to be a major challenge for the SA government. Poor GDP and weaker business confidence coinciding with extreme climate change and inflation have added to the countries poor performance and the outlook for 2018 remains subdued over the medium term with a projected Q4 growth of 0.5 per cent. Of the two main economic harms inflation and unemployment, it is unemployment which is having the most devastating impact on SA society. An important concern regarding the SA job market is the oversupply of unskilled workers with low income levels and a shortage of highly skilled highly paid workers. This situation is especially affecting small enterprises and youth opportunity, linked to this situation, is the low levels of self-employment and entrepreneurship within the country. Small and medium enterprises (SMEs) could play a bigger part in SA’s economic activity through employment, innovation, and growth. However, SA’s strict labour regulations place a huge financial burden on SMEs which inhibit growth in entrepreneurship. The SA Government acknowledges these issues and within its National Development Plan (2030) seeks to address the countries high levels of unemployment and poverty. Through greater investment in education and research and development, better use of existing resources, and more nimble institutions that facilitate innovation and enhanced cooperation between public science. Boosting private investment in labour-intensive areas, competitiveness and exports, with adjustments to lower the risk of hiring younger workers is also seen as a key objective, as is higher education. Currently SA has an underperforming education system and the university education sector does not seem to produce students with the skills needed for the present and future labour market. This brings with it two challenges; student poverty and the pressure on universities to address the social needs of new students as well as the need for universities to compensate for what is lacking in students received from secondary school. Increased public services (such as education, transport, and defence) have placed a significant burden on the public purse. To the extent, that SA’s debt (domestic and foreign) continues to rise. Debt is valued in nominal terms, i.e. the amount the government has to repay when the debt matures. SA has embarked on a programme of fiscal consolidation to stabilize government debt. In the short-medium term, SA’s borrowing requirement consists of the difference between revenue and expenditure, and payments for maturing debt. The gross borrowing requirement in 2017-18 is R246 billion (18 billion U.S dollars). According to the SA National Treasury, projections for borrowing in 2018-19 are expected to be lower at around R225 billion (16.5 U.S dollars). This requirement will be funded through short-term borrowing, (Treasury bills) loans from the Corporation for Public Deposits; long-term loans, which include fixed-rate, savings bonds; and foreign-currency loans. Following the resignation of Jacob Zuma, Matamela Cyril Ramaphosa became President of SA (in February 2018). President Ramaphosa faces social and economic challenges. The chronic lack of skilled workers remains a huge problem to growing the economy for both the SA government and its business leaders. 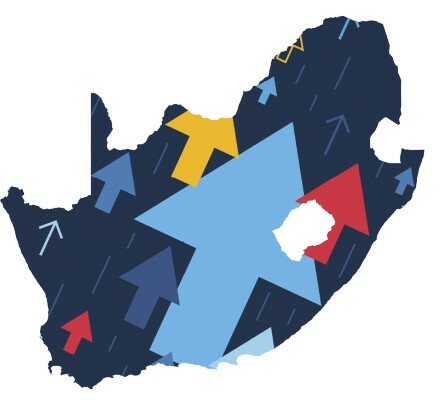 Like many economists, the SA government are of the opinion that local politicians and business leaders must direct local economies to adapt to changing environments. In essence, they need to initiate policy and economic programmes, in partnership with local businesses and communities. Compared to other African countries, SA entrepreneurial involvement is relatively low. It could be argued that the future lies in attracting the youth of the country into employment opportunities which utilise their potential and skills. Major investment in telecommunications technology is likely to fuel growth in entrepreneurship and allow for both greater productivity and business opportunities. SA’s ability to attract future inward investment or FDI is to some extent tied to global investor’s perception of irregular business practices and political corruption. Gaining investors trust is a major task for the SA administration. Dr John McManus is a British academic, and author, on emerging economies, including global and national competition and firm strategy. Dr McManus latest book “Managing Global Business Strategies” is published by Elsevier.